The handy small tech device works as both a cellphone stand and earbud splitter. The suction cup on the back of it is used as the stand. 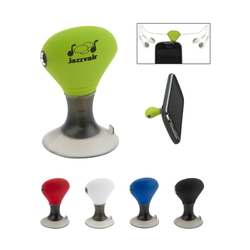 When you remove the suction cup, plug it into the phone to allow two earbuds to attach. It's small enough to be easily portable, making it great for those traveling in pairs. This is the perfect product for sales meetings, trade shows and more.